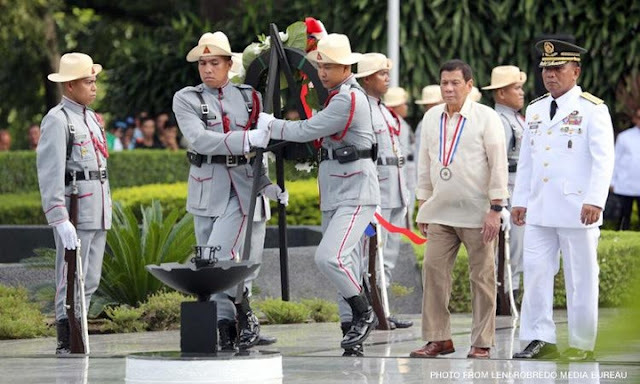 MANILA -- The Armed Forces of the Philippines (AFP) expressed hope that the annual commemoration of the National Heroes Day will help revive the spirit of nationalism among the present generation of Filipinos. "The AFP hopes that the observance will fan the fire of nationalism among Filipinos," AFP public affairs office chief Col. Noel Detoyato said in statement Monday. Detoyato also hoped that the occasion will encourage every Filipino to contribute to nation-building and uphold democracy. "(And) that the spirit of this national holiday will remind every citizen of their duty to the country, especially in protecting the country's democratic institutions," he added. Earlier, the AFP joined President Rodrigo Duterte and the National Historical Commission in commemorating the National Heroes Day at the Libingan ng mga Bayani in Taguig City.